Legislative Council GK Trick of Indian states, which is a favorite question in competitive exam asked on Legislative Council. 7 States which has Legislative Council in India called as ‘Vidhanparishad’. 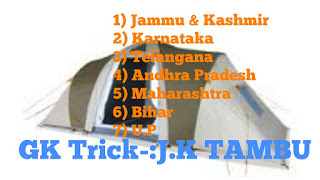 Here, ‘J’ for Jammu and Kashmir ‘K’ for Karnataka ‘T’ for Telangana ‘A’ for Andhra Pradesh ‘M’ for Maharashtra ‘B’ for Bihar & ‘U’ for Uttar Pradesh. Note-:Go by such a type of Sequence so that there will not be any hesitation to remember. So, How was Legislative council GK trick ? For more GK Tricks follow us & also you can watch ‘Vikasanshil ‘ YouTube channel. Indian Standard Time Line Passes Through States GK Trick. India’s Boundary with 7 neighbour Countries From Largest to Lowest GK Trick.